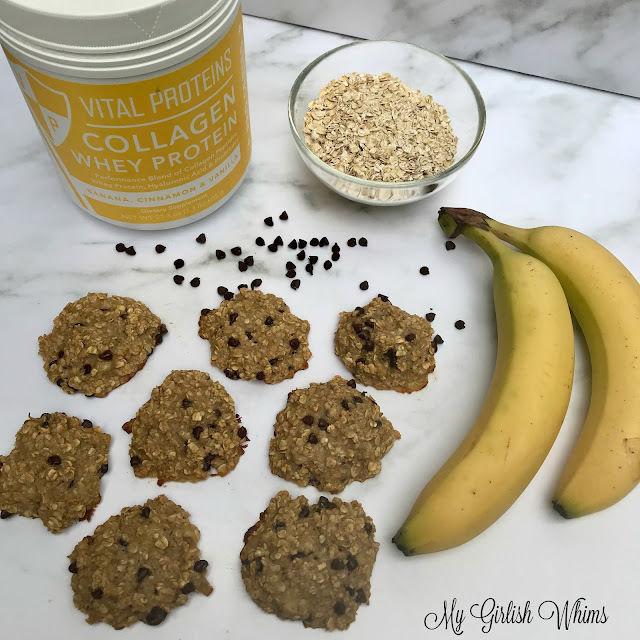 Thank you Vital Proteins for sponsoring this post so I can share the recipe for these healthy and easy banana collagen protein cookies. I am one of those types of people who HATES to waste food. I eat broccoli that is on the verge of making the fridge unbearably stinky and have snacked on yogurt who’s expiration date was two weeks prior because hey: close enough, right?!? I’m a pro at picking between the slimy leaves of spinach in a bag on its way out to use EVERY POSSIBLE fresh leaf left and have definitely eaten some questionably old left-over grilled chicken but have luckily lived to see another day so far! Needless to say, when I see bananas going bad on my counter I immediately think of ways to save them whether by eating, freezing, or using them in a recipe. My stockpile of frozen bananas has gotten exceedingly large lately though, so when I had two measly bananas about to go bad and no desire to pack them for my regular afternoon snack I knew I needed to find a recipe to use them up. 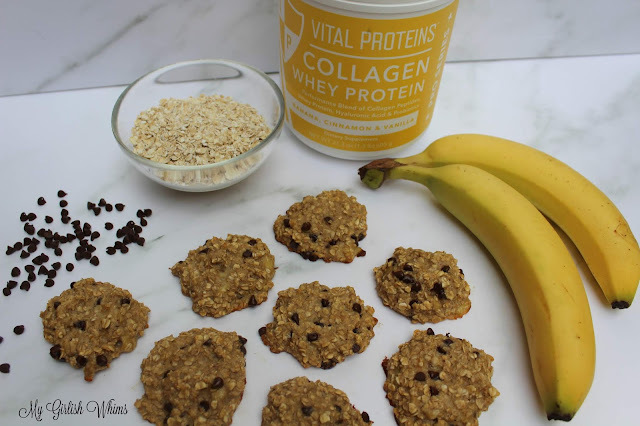 Thus, these 4 ingredient banana, collagen, oatmeal cookies were born! 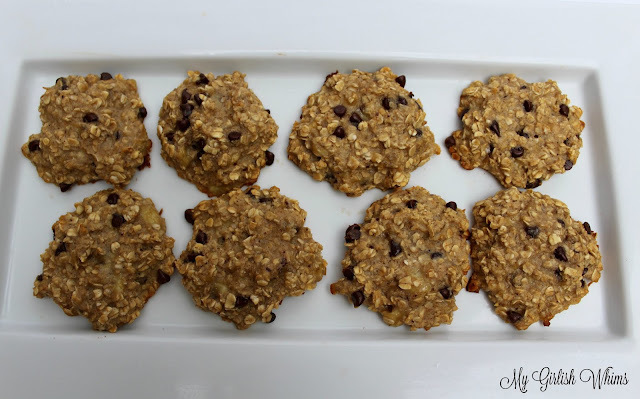 I actually remember making a simplified version of these “3 ingredient cookies” when I was on my weight loss journey. That was back when I had a doggie and I made the mistake of leaving the cookies on the edge of the counter to cool after taking them out of the oven. I walked away and by the time I came back my dog had eaten two whole rows of the cookies!!! Ugh. Darn dog. Luckily he was cute so I let him get away with it and LUCKILY he was ok afterwards as well because these cookies have chocolate chips in them which are a big no-no for dogs! They may be a no-no for dogs…but the chocolate chips are a big YES YES for me in these cookies! 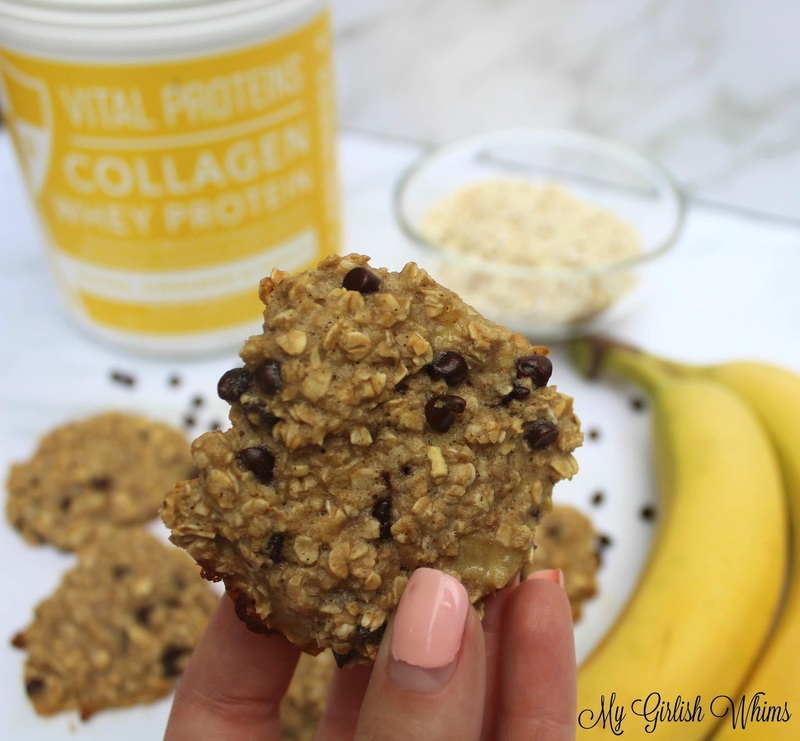 I beefed up the original “3 ingredient cookie” recipe which was only chocolate chips, bananas and oats by adding Vital Proteins Banana Cinnamon Collagen Whey for a boost of protein and health benefits. 2 Scoops of this whey has 26 grams of protein and is also packed full of probiotics for good gut health. It uses real banana, cinnamon and vanilla flavors with no artificial sugars or sweeteners added. 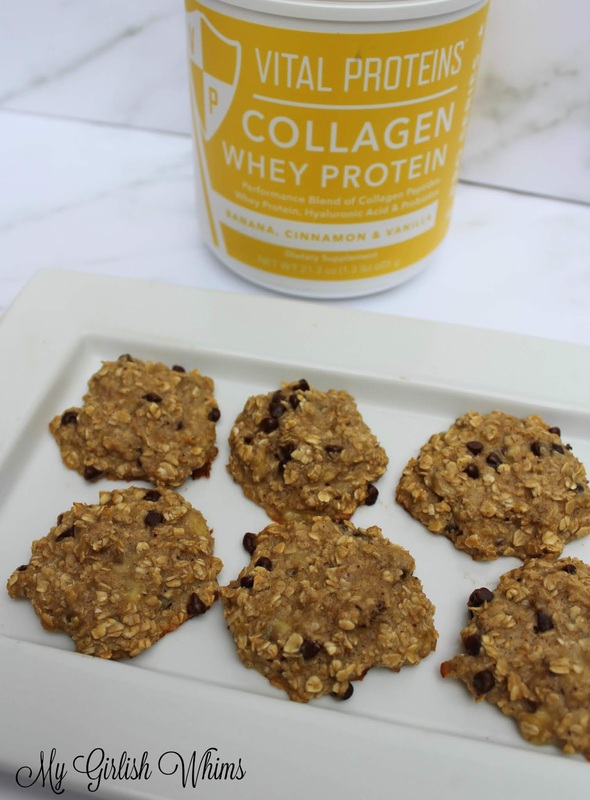 The whey is also combined with collagen to benefit from all the wonders that collagen supplements do for the body such as improved hair, skin and nail health. The collagen whey has a ton of great health benefits AND tastes good as well so it definitely deserves to become the 4th ingredient in these cookies! 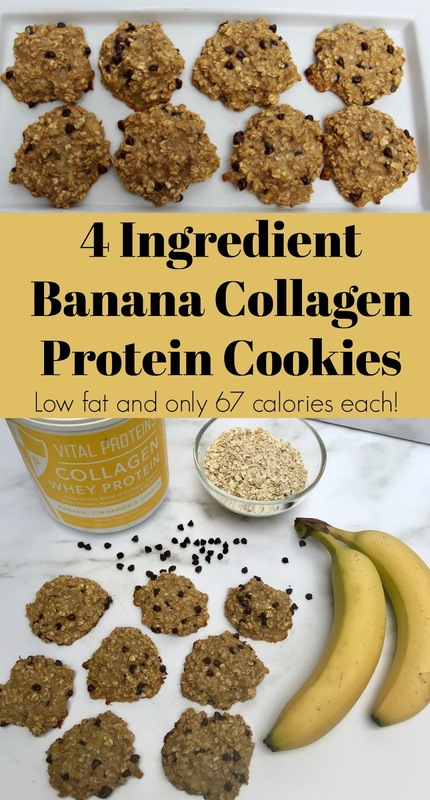 These cookies come together super quick and you only need two bananas to make them so it’s a perfect staple recipe to pull out for when you need a sweet treat. It also only makes 12 servings so you won’t be stuck with dozens of cookies tempting you for days after you bake them. And while cookies are always tempting…these are actually very low in fat and calories so no need for extra guilt when you eat them! 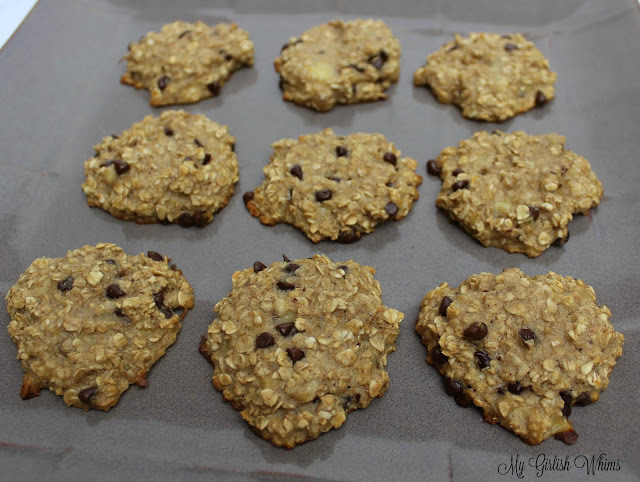 This recipe makes 12 cookies for 67 calories each with 11 grams of carbs, 1 gram of fat, and 3 grams of protein per serving. These healthy cookies need only 4 ingredients and can be baked start to finish in less than half an hour! Preheat oven to 350 degrees FLine a cookie sheet with a silicone non-stick baking sheet and spray with cooking sprayIn a large bowl, mash bananas with a fork Add two scoops of collagen whey and stir until combinedAdd in the oats and stir until combined againAdd in the chocolate chips and mix throughoutScoop batter onto prepared baking sheet in 12 equal circle portionsBake for 15-20 minutes, until edges of cookies begin to brown slightly (I baked for 17 minutes)Cookies best eaten fresh or within 1-2 days. Store extras in the fridge. Wow! I can't wait to make this! I need more healthier snacks and of course, easy to make! Love that this recipe is straightforward and doesn't call for a lot of ingredients! The cakes look appealing, thank you for sharing the way.